Called SOMA (South of Market) by locals, this neighborhood literally begins south of Market Street and continues south to Mission Creek and US Route 101. The boundaries of SOMA vague and often overlap other districts, but the general area sprawls over nearly one square mile. This once-dilapidated neighborhood was revitalized starting in the 1980’s and boasts a vibrant artistic community. 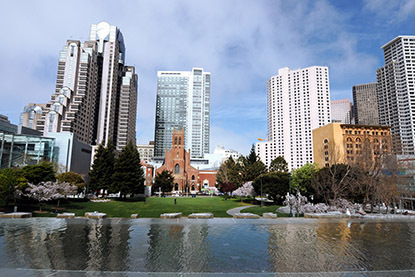 The SOMA district includes restaurants, museums, technology headquarters for Wired and Twitter, small start-ups, the Moscone Convention Center, shopping outlets, a movie theatre, public garden space, and more. Visitors can choose from a wide variety of activities that are perfect for the entire family. Alternately, visitors can drop by the district’s clubs, bars, and secret hideaways for a taste of local nightlife that few tourists see. There are BART stations nearby on Market Street and multiple Muni lines that service the SOMA area, visit 511.org to plan your trip. This public park consists of two city blocks linked by a pedestrian bridge over Howard Street. Yerba Buena Gardens is serene and visually calming. The park includes the Martin Luther King, Jr. Memorial, which consists of a 50-foot waterfall and etched glass excerpts of King’s speeches. The speeches are in the many languages of San Francisco’s sister cities, creating a truly multicultural and inclusive feel to the community park. Beneath the gardens are Moscone North and South, two buildings out of three of the Moscone Convention Center. The Rooftop at Yerba Buena Gardens includes a carousel, Children’s Museum, ice skating rink, and bowling alley. Yerba Buena Center for the Arts this artistic center seeks to engage the onlooker with thought-provoking art that challenges our current ways of thinking to create meaningful change. Watch a modern dance performance, peruse a gallery, or pick up a show program for a list of other exhibits. Moscone Convention Center: The Moscone Convention Center hosts multiple conference and conventions a year. Most notably, the center hosts Macworld Expo, the Game Developers Conference, WonderCon, and the San Francisco International Auto Show. A combined 1,349,717 people visited the center’s buildings for the 2015-2016 period. The Metreon Shopping Center: An all-in-one destination, it includes movie theatres, shopping, dining, and entertainment. It’s located above a portion of the underground Moscone Center. The San Francisco Museum of Modern Art was the first on the West Coast dedicated to the exhibition of modern and contemporary art. Kids get in free on Sundays! With both permanent and visiting collections, this non-profit museum is a priceless cultural experience in the midst of an incredible city. SOMA’s restaurant selection is as diverse as the city itself. Visitors can find Italian, Thai, Japanese, vegan, and traditional American food restaurants among others. The Westfield Shopping Centre, located two blocks north at 865 Market Street, offers shopping, dining, and more in its 500,000 square foot center. Union Square offers hours of retail and high-end shopping. Eat at the Cheesecake Factory on the top floor of Macy’s for a view of the square and of the city. During the winter months, an ice skating rink and holiday tree grace the square, creating a festive atmosphere in the midst of the city lights. Thirsty Bear: Serves freshly brewed beer and offers a menu of over 30 tapas. With its diverse menu and specialty ales, this destination is perfect for groups large and small! The Endup: Long after other San Francisco nightclubs close, the Endup’s party is in full swing! This is the city-wide destination for after-hours clubbing. Featuring a softly lit outdoor lounge area, indoor pool tables, photo booths, and arcade-style games, this dance club is one you should not miss! Union Square: Short hop on a streetcar will get you to Union Square for hours of shopping, dining, and people watching. Chinatown: San Franciso’s most visited attraction and the largest Chinese community on the west coast. Dine on traditional cuisine and shop for imported trinkets.